Cozy nights in are even better with a custom fireplace that exudes impeccable design! Rock fireplaces add a warm touch to any Hill Country home while stone fireplaces can add an elegant energy to the most high-end interior. We’d love to cozy up by any of these fireplaces on a chilly fall evening! Paneled floor-to-ceiling windows, beamed wood ceilings and a creative stone backdrop add to the high design of the fireplace at 5916 Krause Lane. Modern beauty abounds at this picturesque home on lavishly-landscaped grounds, leaving nothing to be desired by owners or guests. Soaring ceilings and generous windows open up the living space at 2009 Laurel Ridge Cove while the fireplace adds a warm touch to the chic interior. Light a few candles and grab a bottle of wine from the 500-bottle wine cellar for the ideal night in on the 11th fairway of the UT Golf Club. You’ll never want to leave the warm glow of the living room at 601 Crystal Creek Drive! A stately stone fireplace is the focal point of the space which effortlessly blends with the kitchen and dining area in a beautifully-thought-out floor plan. Cozy up by a fireplace in either the living room or master bedroom between the Venetian plaster walls at 4408 Longchamp Drive #4. Part of the prestigious Marina Club community, this gorgeous home boasts stunning views of Lake Austin and the 360 bridge to enjoy while relaxing by the fire. Built with river rock hand selected by current owners, the fireplace at 3022 FM 1704 is one to be enjoyed from the start of fall through the winter. With sweeping views from every room and towering oaks framing the landscape, evenings at this home are simply enchanting. Situated beneath towering oak trees, 9409 Cedar Crest Drive boasts a gorgeous Texas limestone exterior that welcomes guests to the retreat-like home. 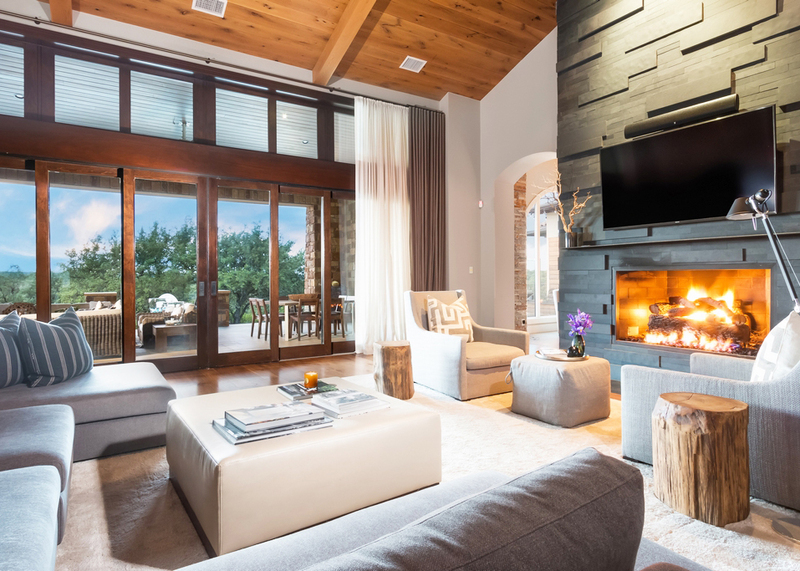 An understated fireplace exudes unique design and draws visitors into the laid-back lifestyle of Northwest Austin. Charm abounds at this Bryker Woods bungalow, which welcomes visitors into the warm living space as soon as they breeze through the doors at 2908 Glenview Avenue. The cozy fireplace sits at the heart of the home, connecting the kitchen and dining spaces with ease. Breeze through the doorway of 4513 Court of St James and you’ll find a beautifully-executed living space with towering windows and a stone fireplace to enjoy on the chilliest evenings. Lush Hill Country landscapes are better enjoyed by the light of the fire! Make the most of the cool fall weather in Austin — You don’t want to miss the city’s most anticipated events and festivals of 2018! A trip to one of the Hill Country’s top wineries coupled with a night of stargazing or head out to Gruene for a weekend escape.